The month of May isn’t just for the Kentucky Derby, the Indy 500, or dances around the Maypole anymore. The theme for 2003 is all about getting (Re)loaded! Anyone who has been anywhere near a television, movie theater, magazine stand or even outside the house in the past month and a half is fully aware of the existence of this box office juggernaut (sorry X2 fans, I’m not talking to you). 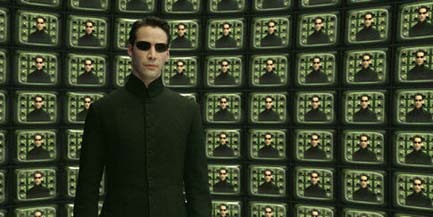 Not only is this sequel to the groundbreaking 1999 science fiction/action smash The Matrix going to break the record for R-rated film opening, it stands every possibility of becoming the biggest opening film of all time (though I do believe it will fall just a little short of that mark). The buzz is deafening on this one. The Matrix Reloaded is going to be the highest grossing movie out of all May releases in a month full of strong, quality product. Time will tell as to where it will place among all films released in 2003 (either the final chapter of the Lord of the Rings trilogy or a little movie known as Matrix Revolutions has an equally strong shot at the top), but the certainty is that all of these films will be among the top grossers of all time. In this case, the sharks in question aren’t precisely the stars of Finding Nemo; however, they’re certainly going to have a lot to do with the movie’s success. Unlike their fiercer kindred, Bruce and Chum are played for laughs in this latest CGI offering from Pixar and Disney. After four very successful outings from the animation studio, there’s no reason to believe that Finding Nemo should be any less successful. As the name Pixar has become more and more of a recognized brand, parents recognize that these consistently outstanding films are not only terrific for kids, but they’re really great fun for all ages. By the time final box office numbers come in, Finding Nemo should wind up in the top five for the year, and I think it will even finish ahead of X2 by the time it’s all said and done (though I do think X2 will have the better opening weekend). Okay, so there aren’t really any Teenage Mutant Ninja Turtles in X2: X-Men United. There is a guy named Nightcrawler, though. And also a Wolverine, a Shadowcat and a Beast. They’re all just super-heroes based on comic books, anyway. Again, like The Matrix Reloaded, ads and promotion for X2 have been phenomenal and ubiquitous. The original 2000 film that introduced the characters has firmly established a new super-hero fan base thanks to a huge run in theaters in addition to a healthy life on DVD. Thanks to this concerted effort at building a solid audience, X2 should have a tremendous opening weekend and finish its theatrical run with a huge chunk of change that will likely place it among the top five earners of the year. Though you probably might have thought that this thematic ground was more than adequately covered in the three-film series that starred George Burns as God (and occasionally The Devil), Jim Carrey’s back to give it another go with a slightly different twist - rather than playing the John Denver role, where the character had to prove that humanity still had faith, In Bruce Almighty, Carrey is instead a guy who says that God’s job is easy. God, who happens to look a lot like Morgan Freeman here, gives Carrey all of his supernatural power and as an added bonus, the responsibility to pass judgment and make daily godly decisions. After a series of mediocre box office performances with more serious roles in films like Man on the Moon and The Majestic, Carrey looks to be back with a vengeance in the type of role audiences have come to expect from him. He’s again paired with director Tom Shadyac, who previously worked with Carrey on one of his bigger hits to date, Liar, Liar. With a bevy of hilarious commercials and extremely well-received theatrical trailers, Bruce Almighty looks to put Carrey back on track as one of Hollywood’s most reliable leading men. Take one atmospheric caper film. Add a bunch of big stars, both headliners and quirky character performers. Toss in a dose of cool, and you’ve got an enjoyable, stylish film like 2001’s Ocean’s 11. Someone at Paramount must have been paying attention, because this month we’ve got the remake of a very similarly-toned movie from 1969. Replace the folks like George Clooney, Brad Pitt and Julia Roberts with Mark Wahlberg, Edward Norton and Charlize Theron. Instead of Bernie Mac, Elliott Gould, and Don Cheadle, The Italian Job will feature Mos Def, Donald Sutherland and Seth Green. So far, the trailers and ads for this film have been a lot of fun, and thanks to their exposure in larger blockbusters such as Planet of the Apes and Red Dragon, Wahlberg and Norton are definitely actors with the capability of contributing to a strong box office performance. Look for The Italian Job to be one of this summer’s sleeper hits. Though Ewan McGregor does in fact star, please don’t make the mistake of confusing the title with Pillow Book. Obviously, one is a lighthearted romantic comedy starring Rock Hudson and Doris Day, and the other one is a film in which we see McGregor’s twig and berries. Down with Love is a film that is truly intended to be in the tradition of Pillow Talk, and along with McGregor, it stars one of the hottest actresses this side of Nicole Kidman in Renee Zellweger. Where Far from Heaven was able to find earlier critical success by drawing inspiration from the films of Douglas Sirk, Down with Love is hoping to be similarly recognized as a throwback to a different kind of genre, though from the same era. Its two stars will certainly be a draw, and the colorful rom-com should be perfectly targeted counter-programming in a month where science fiction and comic book heroes are all the rage. Put former Saturday Night Live star Steve Martin together with a bunch of kids and you get a memorable comedy that still resonated thanks to its occasionally serious treatment of its subject matter. In Daddy Day Care, we join former Saturday Night Live star Eddie Murphy onscreen with a bunch of brats in a movie that seems to predominantly rely on toilet humor for success. Though Murphy’s star has been somewhat tarnished recently, this flick looks like it has all of the elements needed to put him back in Hollywood’s good graces. 2002 was a really bad year for Murphy. He starred in three bona fide flops - Showtime, The Adventures of Pluto Nash and I Spy - showing that moviegoers are slightly less enamored of the man’s antics now that he’s approaching middle age. Daddy Day Care, therefore, stands on some precarious ground. Murphy’s costars aren’t draws at all, though Steve Zahn is a fun, quirky actor who just needs to find a better agent. Even so, Daddy Day Care looks as though it’s a film that could be fun for the entire family, and it does have the added power of Revolution Studios, which really has a knack for promotion. Look for this film to start strong, but if it’s awful, expect a quick dropoff in audience. Even though The In-Laws is a literal remake of the earlier Alan Arkin/Peter Falk flick by the same name, for some reason it feels a lot closer in spirit to the 2000 success story Meet the Parents. Perhaps this is because Michael Douglas plays a CIA agent, which feels very reminiscent of Robert DeNiro’s character in Meet the Parents. Additionally, this modern-day update also takes an actor who has been traditionally known for his more dramatic roles and puts him into a more comedic part (though those of us who remember Romancing the Stone know that Douglas has a knack for the funny). Instead of a nebbish Ben Stiller, in The In-Laws we have the an older version of a similar character - Albert Brooks. The In-Laws should have strong appeal for a more mature audience looking for a comedy, but it’s not likely to light up the box office unless it’s really, really good and gets terrific word-of-mouth. Look for a middling performance, with a likely very solid life on the rental circuit. I know! We just saw this movie a month ago, only in that case it was big Nickelodeon star Amanda Bynes while in this month’s offering, The Lizzie McGuire Movie, we get big Disney Channel star Hilary Duff. Both young actresses have a strong following, and both of them have co-starred in a movie with Frankie Muniz at some point in the last year and a half. Which young ingenue is the greater box office presence? Both of the teenage stars have their fanatics. But since What a Girl Wants is really the truest comparison available for The Lizzie McGuire movie in that they share a completely similar demographic market, box office for the Duff version should wind up very close to the film that managed to hit the market first. How can you go wrong with a movie about teenage cannibals? So, so many ways. Really, the only thing Wrong Turn has going for it is star Eliza Dushku, who definitely has a solid following thanks to her turn as Faith on cult television series Buffy the Vampire Slayer and Angel. Unfortunately, her presence didn’t help Soul Survivors any. Depending on the marketing for Wrong Turn, which has so far been nonexistent to the point that I wonder if this film won’t just go straight-to-video, it could either strike a chord with the fans of the horror genre, or it may just pass into oblivion. My bet’s on the latter.